In this post, we bring you some of the best hospitality schools in 2018. Are you looking for hotel management as a career option? If you are looking to get a diploma or a degree from one of the top hotel management schools, then you are in the right place. We have compiled this list using our own research and hospitality network. We have integrated into our research super prestigious QS Top Universities ranking and the ranking by Ceoworld magazine. All these rankings use Global reputation, job placement rate, employer reputation, consistency, specialisation, faculty and infrastructure are few of the many parameters considered while compiling the list of top hospitality schools. Just a word of caution here. We at Global Hospitality Portal ensure that every bit of integrity is maintained while we collect data for your ease. However, we don’t make any claims with these rankings of top hospitality schools in 2018. This is for reference purpose only and we don’t endorse these Hospitality schools or Hospitality Management Universities. All of these are superiors quality Hospitality institutions and thus instead of ranking them, we have just mentioned them alphabetically. If you are looking to become a prominent chef then you can also look at our post on Top Culinary Schools in the world. The prestigious QS Top Universities ranking released in February 2018. The ranking has listed in it’s top 25 a lot of hospitality management schools from Switzerland like SHMS, Glion, Les Roches, EHL etc. We would not be able to cover all the great hospitality schools in this post however, we will ensure to leave you with enough resources to carry on with your research for best hospitality schools around the globe. One of our other extremely popular posts lists most of these in details. 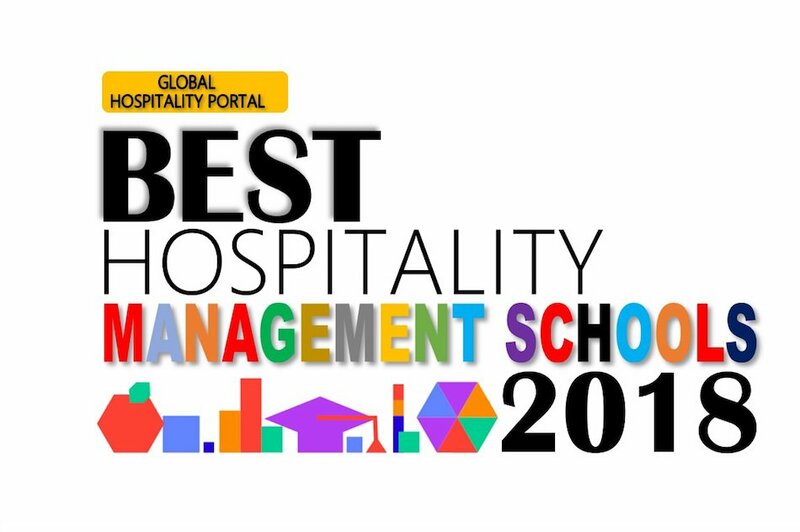 So please do refer to our guide on Top Hospitality Management Schools in the World. In this post, we have listed both the best Hospitality Schools and top Universities offering Hospitality Management Courses. From careers in hotel management to administration and catering, there are many career opportunities in the hospitality sector, which explains why the industry is responsible for employing more than 8 million individuals in the U.S alone. To cater to the high demand for jobs, the recruitment numbers in hospitality schools have also increased drastically. Ceoworld magazine listed Cornell School of Hotel Administration as the top Hospitality School in the world in 2017. With a cumulative score of 98.7, this prestigious institute ensured its hold on to its numero uno status. The Cornell hospitality school teaches the perfect blend of hospitality and administrative skills which in return offers students endless opportunities in the exciting field. The school offers undergraduate, graduate, as well as executive education to those that are already in the field and are looking to advance their skills. Check out all the Hotel Management Programs Offered at Cornell. Students can benefit from the school’s expansive network which is always a plus for those that want to work internationally. Cornell School of Hotel Administration also has both paid and Free Online Hospitality Management Courses. This hospitality management school situated in Switzerland comes highly recommended for anyone that is interested in getting high-quality learning and job placement opportunities. This is the first Hotel schools in Switzerland and is the recipient of almost all Hotel awards. It is often described as the best hospitality school in the world and it trains students to aspire to high ranking positions in the field such as those of the managerial variety. Often abbreviated as EHL, this is no ordinary hotel management school, which is why it is considered one of the best there is. EHL is a great school because it offers students great opportunities all over the world. Students that attend this hotel school get to enjoy the pleasure of working alongside world-class hoteliers and chefs during study and training. The Ecole Hoteliere de Genève is another great institution whose accredited courses are accepted and recognised in all parts of the world. It is favoured for its strict student intake and its partnership with some of the most highly rated business in hospitality. Students who graduate from the school go on to achieve great things in their respective fields. educations.com lists a lot of colleges and universities which rank right there at the top as far as Hotel management institutes are concerned. This is also one of the best hospitality schools in the world because of it’s small and specialized nature. Les Roches International School of Hotel Management places a strong emphasis on the learning experiences of the students that attend and for any individuals that are interested in pursuing a career in hotel management. It also allows individuals to audit a class for a day. 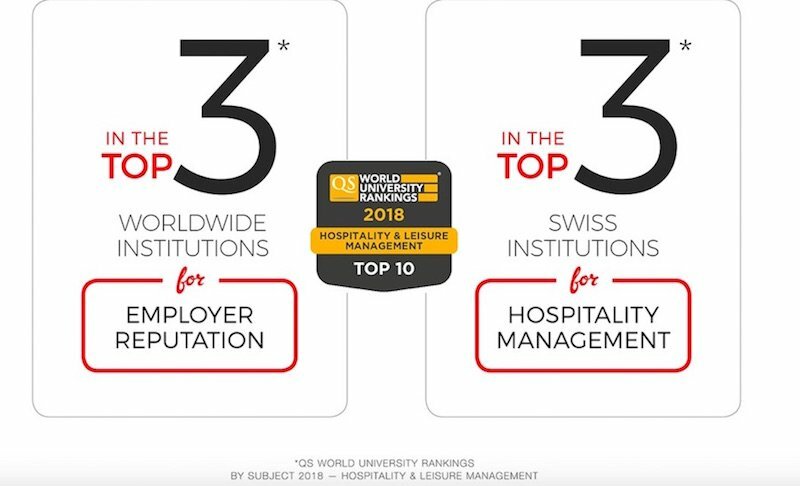 In the QS Work Ranking for Best Hospitality Schools in 2018, Les Roches was ranked 3rd for Employer reputation globally which in itself reflects on the quality of this Hotel school. Les Roches is located in Switzerland, Spain and Chine and also offers MBA course in Hospitality. It has students from over 100 nationalities in its 3 campuses. The Oxford Brookes University International Hospitality Management program is one of the most highly rated in the world. The school accepts students from all corners of the globe and walks of life which is ideal for anyone that wants to study abroad. BSc. in International Hospitality Management is one of the most popular courses here. This is one of the top hospitality schools in 2018 and the school has only improved upon its stature and reputation over the years. Check out the Hotel Management Programmes at Oxford Brookes University. The hospitality school at the Hong Kong Polytechnic University is ranked right among the top hospitality schools in the world in 2018. The School of Hotel and Tourism Management (or SHTM as it is popularly known as) offers various high-quality courses. It is often associated with excellence when referring to hospitality and tourism studies and it is also well liked for offering a number of scholarships and rewards. The school offers courses at all levels ranging from undergraduate to doctoral so it is one of the best locations to attend if you want to continuously advance yourself. Students that have attended previously have reported immense support in terms of professional support even after graduating. Every year, the Rosen College of Hospitality Management (University of Central Florida) offers 600 students a once in a lifetime opportunity to engage with veterans in the field. Located in one of the most visited places in the USA, this resort styles Hospitality Management college is a treat for the students. The state of the art campus, focus on innovation, hi-tech classrooms and focus on entrepreneurship makes this college one of the top hospitality schools in 2018. The mentorship program collaborates with over 150 experts and established professionals that impart their experience and knowledge to participants so that the students can prosper. QS Top Universities ranking has listed University of Nevada as the topmost provider of hotel management education in the world. This is indeed an achievement as QS rankings are extremely reputed and use an extremely rounded and comprehensive methodology to rank institutions. The William F. Harrah College of Hotel Administration at the University of Nevada accepts students from all parts of the world and across the United States. It unites students with great mentors that guide their professional journey. The hospitality school at the University of Nevada offers broad education approaches to those looking for a solid career in hospitality. The varied number of courses available can suit students looking for both managerial and operational competencies so it prepares students for entry-level careers with opportunities for advancement once they graduate. Since it is located in one of the most hospitable states in the country, students are uniquely placed to enjoy several benefits. Check out the top 50 Hospitality management universities and Hotel Management schools as ranked by the QS in this listing by QS Top Universities. Check out the list of top 50 Hotel Management and Culinary Management Colleges in the world in 2017 as researched and compiled by the CEO World Magazine. USA led the pack with 26 entries to this prestigious list followed closely by Switzerland. If you are interested in a career in hospitality, there are plenty of Top Hospitality Universities and Top Hospitality Schools situated all over the world that can help you gain the skills and knowledge that you need to start or advance your career. When looking for a school you want to check the hotel management college ranking when making your decision to make an informed choice. There are various top schools from Hong Kong, Switzerland, and the United States that are ranked as the best performing schools. To get you started, we had listed the top hospitality universities and best hospitality schools in the world in this post. Hope you found the list informative and interesting. We have also ensured that we squeeze in enough resources in this post for all the prospective hoteliers and leaders to help them take a great decision.